What a sweet day I have had! Tuesday has turned out to be very tasty indeed! My appointment with Radiotherapy went so well they don't want to see me for a whole year! Course, I have appointments for the other departments in May, June and October and apparently need a mammogram in August, but we won't think about those just yet! The Dr said I can start to relax now: indications are that they got it all, though of course they cannot guarantee anything. That will do for me!!! Of course, the lady from the Irish Cancer Society felt the need to remind me that Five is the magic number. Yahboosucks ICS Daffodil lady!!! T'is all statistics and I prefer the other way of thinking. Then we had a walk around Galway: Galway is one of my most favourite places in the whole world! I bought some popcorn kernals and will make some popcorn as soon as I have finished here..and then I will put in the last 30 stitches into my new Holmsey chart. Bless this bunny (hare): he has become a good friend! He's very pleased I have become vegetarian as well: he is super pleased that I can now stitch Fergus without thinking about venison casserole! And how am I finding eating only veggies? Loving it. Tea was home-made red pepper humous in pitta with red and white cabbage coleslaw and sweet potato falafals. Easy, quick and very tasty! In keeping with the theme of my day! The new Holmsey chart does of course have a wee tale with it. But for those of you who haven't read it, here is the tale...so you will know what the next one is about. This one is a little long (the future ones will shorter) so if you aren't interested in the tales of Holmsey, stop reading now! 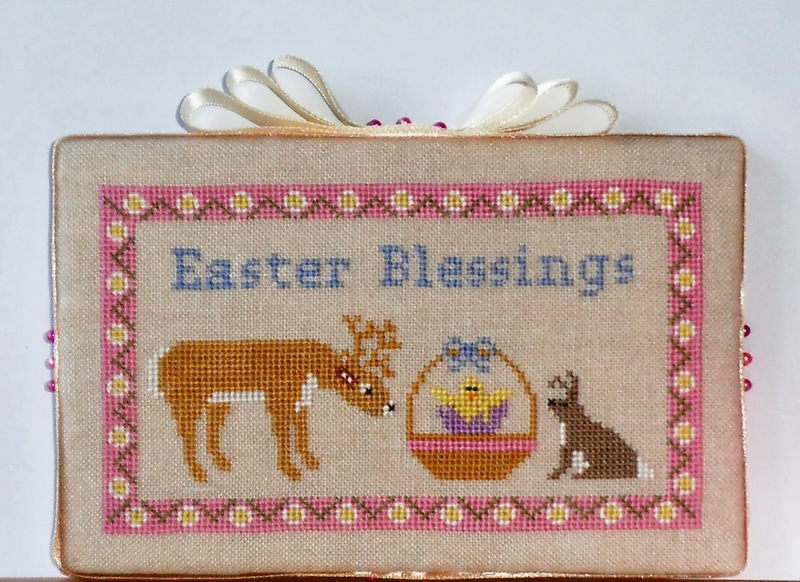 Pop along to my last post to see an Easter Freebie, and have a great week! Holmsey leaped up with a shock as he was rudely awakened from a lovely sleep. What on earth had woken him up? He was answered when a particularly loud blackbird began to sing the second verse of his song from a branch directly above his cosy straw bed. He groaned and wrapped his long ears tightly around his head as he tried to snuggle up and return to the land of Nod. He’d been having a particularly pleasant dream in which he was surrounded by lots and lots of bright orange carrots. It was no good though. Now awakened, he couldn’t block out the sound of birdsong. It seemed all of his feathered neighbours had decided form an orchestra and were all singing as loudly as they could! Holmsey yawned and stretched out. Well, no doubt it was time to get up anyway. Besides, it was a lovely, sunny morning which was far too nice to waste! He stretched once more before slowly climbing out of his bed. He sat for a moment to give his whiskers a lick and a wipe and as he performed his morning wash, he allowed himself a moment to become aware of his surroundings. The air filled with birds flying past carrying nest materials. Twigs, strands of hay and even little fleecy pieces of white wool which had been caught in barbed wire could be seen in their beaks. And although the birds were busy, busy, busy, they sang loudly and happily as they worked. And with it came the scent of love, nests, chicks and babies. It all seemed too much like hard work to Holmsey. He considered himself far too old to think about marriage and children. He much preferred the quieter pleasures in life. He enjoyed wondering through the meadows and forest with his friend Fergus, and having nothing more to worry about than what his tummy most fancied for breakfast, brunch, lunch, tea or supper. Holmsey ran his long, silky ears through his paws as he gave them a final lick and a polish and prepared to go out and find something nice to eat. After breakfast, he would go and see if he could find Fergus but first things first. His tummy gave a loud gurgle. Breakfast was far more important than visiting friends! He hopped first along one pathway and then onto another as he journeyed through the meadow. Occasionally he would nod a greeting to a passing hare or the odd hedgehog but everyone seemed too busy to stop and chat. Yes, it was definitely spring time! Now, Holmsey is, on the whole, a very sensible hare with a reputation for being kind and gentle. He is known for being a hare that can be counted on in times of crisis. Sadly, he is also a hare with a weakness. Holmsey is known for being a little bit greedy! He loves his food. Food is a passion. He is very particular about what he eats and he is even more particular about the quantity! The more the better! He adores food. You could say that Holmsey is at times ruled by his appetite! And today Holmsey’s appetite was leading him along a particularly favourite pathway in search of the nicest, freshest breakfast. He slowly hopped along, his head bobbing from one plant to another as he took a taste of a leaf here and a mouthful of another leaf there. Then, just as he was stretching up for a particularly fine dandelion flower, he noticed a large, brown wicker basket on the pathway. He wandered over to investigate. It was quite a large basket and on its handle was a large, blue satin bow. He stood on his tiptoes to see if he could see what was in it without getting too close. It seemed to be filled with eggs! He carefully and quietly moved a little closer to take a better look. Holmsey gave the basket a wary sniff. And what he sniffed was unlike any egg he had ever come across before. The eggs smelled sweet! They smelt sugary! They smelt out-of-this-world gorgeous! Oh my! What on earth would the other hares say if they found out his mouth was watering at the thought of eating an egg? Hares don’t eat eggs! Holmsey decided he had better take a closer look. After all, these eggs were all alone! Where was the mother bird that should have been looking after them? What Holmsey didn’t realise was that a little earlier in the morning a group of ladies had come to visit the meadow. They were trying to organise a Grand Easter Egg Hunt! They were going to hide eggs in the grass, under the bushes and along the hedgerows so their children would have fun finding them in the Grandest Easter Egg Hunt ever! The ladies soon realised however that meadows are filled with nature, and nature has a habit of leading to cuts and grazes, muddy knees and dirty shoes. They decided the meadow probably wasn’t the best place for a Grand Easter Egg Hunt after all and drove off to find a nice, clean village hall. Village halls are definitely the best place to have a Grand Easter Egg Hunt! The ladies were so busy chittering and chattering and talking about shoes as they left that they didn’t realise they’d left behind a basket filled with Easter eggs! Holmsey hopped closer still and had a good peek at the eggs. There were six or seven in the basket, and all but one were covered in shiny, colourful paper. Filled with curiosity, he gently picked one up. As he did so, one of his claws accidently caught the shiny paper, pulling it off. Underneath was a smooth, brown layer which oozed with the scent of delectable delight! “Well, how remarkable!” thought Holmsey. He had never come across an egg like this before! He sniffed again, and then simply because he couldn’t resist it, he gave it a little lick. Oh my word! This wasn’t a bird’s egg! This is chocolate! Holmsey had tasted chocolate once before. It was a long, long time ago when a large and noisy family had come to the meadow for a picnic. They didn’t really notice the nature around them and so didn’t bother picking up their rubbish to take home with them! Holmsey did what any sensible hare would do. He tidied it all up so no one would be harmed by the plastic bags or tin cans. He’d found a left-over chocolate bar amongst the rubbish and ate it. It seemed easier than going to the trouble of taking it over to the old, rusty bin near the fence. He enjoyed it very much! It certainly made the effort of tidying up the rest of the rubbish very worthwhile indeed! And now here he was with an entire basket of chocolate eggs! Well, he would be good. He would just eat one and he would take the rest with him to find Fergus and they would share them. So with his paws, he delicately peeled off the rest of the shiny foil, making sure to put the scraps back into the basket. He very slowly licked the sweet chocolate. He took a little nibble. Then he took a mouthful! And then he gobbled it down quickly! Darn it. He’d eaten it so quickly he didn’t really have a chance to taste the chocolate properly! Oh well…just one more then. And then a few more until there was just a single, large purple egg left in the basket. It was the only egg not to have any wrapping on it. Holmsey felt a little queasy. His tummy wasn’t very happy at all and his healthy appetite felt decidedly unhealthy! He gave a little groan and rubbed his poor, sore, plump tummy. “Oh dear me, oh dear me,” he cried piteously. “Hello Holmsey” came a cheerful greeting from behind him. The happy-go-lucky deer had had a fun morning with the other deer playing ‘catch me if you can’ but he’d missed his friend Holmsey. Since he hadn’t come to visit him after breakfast like he usually did, he decided he should go and visit him instead! “Oh hello Fergus” came the muted reply from the very poorly hare. Fergus looked at Holmsey with wide eyes. What was wrong with him? His voice was so tiny and yet his tummy was so big! He didn’t look very well at all! Fergus nuzzled him in concern. “Are you ill Holmsey?” he asked. Fergus looked at Holmsey’s plump tummy and it occurred to him that Holmsey had had more than a little too much. For once though, he had the wisdom to keep his thoughts to himself. He could see that his little friend was not very well. In fact he looked ever so slightly green in the face. “What’s chocolate Holmsey? Is it one of those nasty tasting herbs you make me take when I’m feeling poorly? Have you had too much medicine?” he asked. “Deer don’t eat eggs” replied Fergus in surprise. Fancy Holmsey not knowing that! “Well thank you” Fergus said with a doubtful note in his voice. He looked over the top of the basket at the egg and he looked back down at Holmsey who was definitely not looking his best. Fergus saw how ill his friend looked and he was quite sure chocolate couldn’t be a good thing to eat! “Here, come and try some” Holmsey said encouragingly. Poor old Holmsey was feeling very, very sick by now and just wanted the last dratted egg gone before his appetite decided it wanted more. Fergus looked into the basket. As he peeked, the last remaining purple egg, rocked. Then it rolled. It wobbled and wibbled and it really didn’t look very appetising! “I don’t think I want any chocolate today.” Replied Fergus who was watching the egg jiggle around with dismay in his eyes. Who would want to eat something that moved? “Don’t be silly Fergus!” Holmsey was getting a little bit irritated. But by now the egg was positively dancing around and Fergus had no intention of tasting it! It jolted suddenly and Fergus shot back! In alarm, both Holmsey and Fergus took a slow step forwards and peered into the basket. Suddenly the egg gave an almighty ‘CRACK!’ and out popped a little golden chick! It looked first at Holmsey and then at Fergus. Aww a sweet easter story. Yummy... that ice cream does look inviting. Congratulations on the wonderful news on your test! 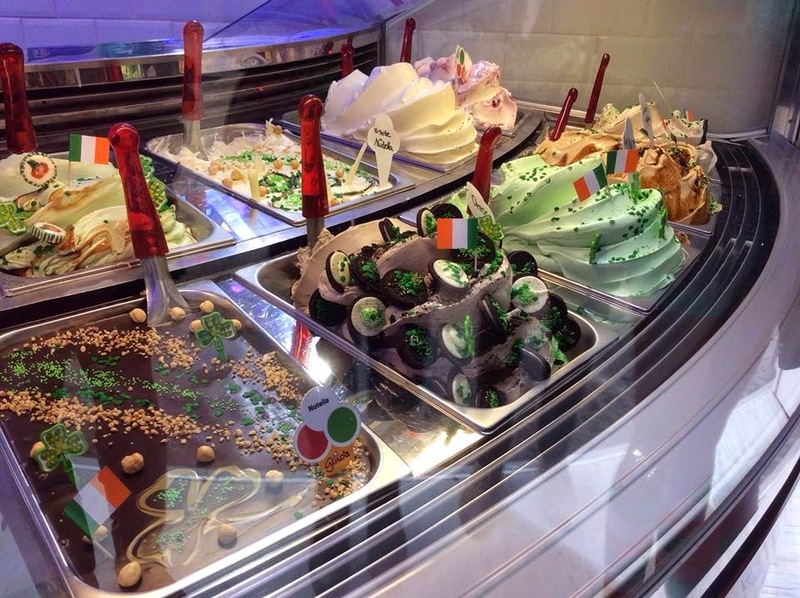 That gelato looks amazing! Good for you and the vegetarian diet. I need to do this. Lovely Easter design. So pleased to hear your news. Thanks for all you share; you're quite inspiring! I agree with everyone else ... great news from your doctor! Ah, gelato. I remember eating that in Italy. I'm sure the Italians make it for God in heaven : ) Cute stitching & story. Congrats on becoming a vegetarian! Love the story as always - you really should write a book!